The First WikiConference India is being organized in Mumbai and will take place on 18-20 November 2011. You can see our Official website, the Facebook event and our Scholarship form. But the activities start now with the 100 day long WikiOutreach. As you are part of WikiProject India community we invite you to be there for conference and share your experience. Thank you for your contributions. My name is Victor Grigas, and I'm a storyteller at the Wikimedia foundation. We're telling stories of Wikipedia users, editors, donors, programmers and staff to paint a picture of who uses Wikipedia - for the 2011 fundraiser. I am in the process of planning a trip to India to gather stories from Indian Wikipedians in face-to-face interviews (possibly on video). My primary goal is to conduct 15-20 interviews, and hopefully enough of my interviews will make compelling stories that will effectively solicit donations from the public. These stories may also be used for other communication purposes by the foundation. I found your userpage on a list of prolific Wikipedians and thought I’d reach out to you. Prolific editing is always a good story to tell! Users with Marathi language background are kindly requested to test all Visual Editor features along with Marathi language display settings and file the bugs wherever necessary. Gppande, Presently you are on english wikipedia, You are invited to Marathi Wikipedia!This template shall keep you informed about support and contribution required in various Marathi Wikipedia articles in times to come. नमस्कार, Gppande आपण Marathi language- किंवा Maharashtra-विषयक लेखात जे योगदान केले आहे त्याबद्दल धन्यवाद. इंग्रजी आणि मराठी विकिपीडियावरील सहयोगच्या माध्यमातून विकिपीडिया संबंधीत प्रकल्पांचा आणि लेखांचा आवाका आणि गुणवत्ता सुधारावी या हेतूने विविध प्रकल्पाची आखणी केली आहे आपण या विकिपीडिया:प्रकल्पात लेखन योगदान करून या प्रकल्पाचा हिस्सा व्हावेत या सदिच्छेने मी आपणास हे निमंत्रण देत आहे. मराठी विकिपीडियात लेखांचा मराठीत शोध/अथवा लेखनासाठी ह्या व्हिडिओत दाखवल्या प्रमाणे मराठी आणि नंतर अक्षरांतरण पर्याय निवडा अथवा इनस्क्रिप्ट साठी 'मराठी लिपी' पर्याय, Click on the 'cc to change the subtitle languages to Marathi, English, Sanskrit, Kokani,Ahirani. आपल्या मराठी विकिपीडियावरील सहभागाबद्दल, सहवासाबद्दल आणि उत्कृष्ट योगदानाबद्दल हे मराठी विकीचे अभिमान गौरव निशाण मराठी विकिपीडियाच्या सर्व आजी माजी वाचक,संपादक, आणि चहात्यांना अर्पण करण्यात येत आहे.आपल्या आवडीचे वाचन,लेखन संपादन असेच सदैव घडत राहो हि शुभेच्छा!! या चक्र चिन्हा जवळ आपण नॅव्हीगेशन तसेच लिहिण्याची भाषा निवडू शकता ? आपण Special:Preferences पानावर Internationalisation मथळ्या पुढे सुद्धा mr-मराठी भाषा निवडून नॅव्हीगेशन म्हणजे सुचालन मराठी भाषेतून करू शकता. 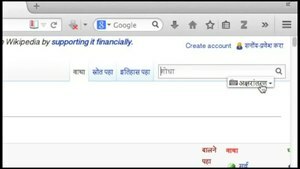 How do I type in Marathi मराठीत टायपींग कसे करू ? Marathi Wikipedia typing in progress. Thanks to all Wikipedians who have been supporting Marathi Wikipedia through various means like interwiki linking etc. We are organising a Photowalk for images/videos/audios related to Mumbai and Mumbaikars. Recognition: Certificates will be awarded to prize winners. Best images will be featured in the respective article page on Wikipedia. Upload: Files have to be uploaded to Wikimedia commons through the photowalk portal using a customised version of the commons upload wizard. Or if you choose to upload directly to commons, the category "WTM" has to be added to the files. All files should be uploaders own work. Copyright expired and PD/CC images of others are not eligible. Hi. We're into the last five days of the Women in Red World Contest. There's a new bonus prize of $200 worth of books of your choice to win for creating the most new women biographies between 0:00 on the 26th and 23:59 on 30th November. If you've been contributing to the contest, thank you for your support, we've produced over 2000 articles. If you haven't contributed yet, we would appreciate you taking the time to add entries to our articles achievements list by the end of the month. Thank you, and if participating, good luck with the finale! In 2017 – 2018, the Wikimedia Foundation and Google working in close coordination with the Centre for Internet and Society (CIS), Wikimedia India Chapter (WMIN) and user groups from India, are piloting a program encouraging Wikipedia communities to create locally relevant and high-quality content in Indian languages. This program will (a) support active and experienced Wikipedia editors through the donation of laptops and stipends for internet access and (b) sponsor a language-based contest that aims to address existing Wikipedia content gaps. Looking forward your participation, all the best. MediaWiki message delivery (talk) on behalf of Krishna Chaitanya Velaga (talk • mail) at 22:21, 21 March 2018 (UTC). Return to the user page of "Gppande".